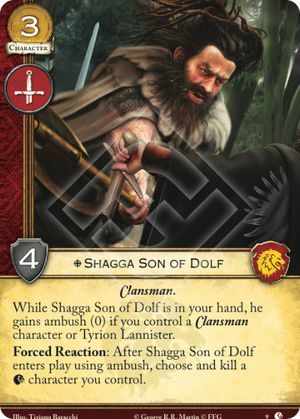 While Shagga Son of Dolf is in your hand, he gains ambush (0) if you control a Clansman character or Tyrion Lannister. Forced Reaction: After Shagga Son of Dolf enters play using ambush, choose and kill a character you control. Lions of Casterly Rock #9. After Shagga enters play using ambush, if he is the only Lannister character that you control, you must choose and kill him.